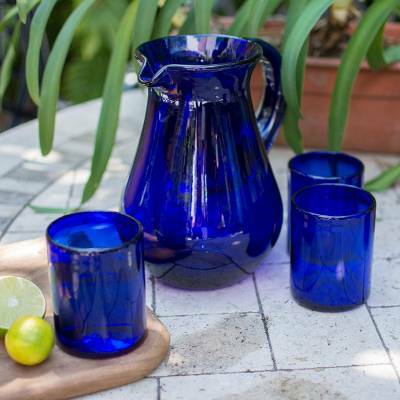 Mesmerizing with its cobalt translucency, this pitcher offers the allure of Mexico's blown glass artistry. From the NOVICA Handblown Collection, this singular piece is crafted by hand with traditional blown glass techniques. The pitcher's design is elegant, voluminous and makes pouring easy. Pitcher: 22 cm H x 20 cm Diam. Pitcher: 8.75" H x 7.75" Diam. Jut got it, put it on my kitchen window so it gets winter sun. Kitchen looks so much brighter, great pop of color! Very well made, excellent craftsmanship! Adds just the right amount of color with simple and beautiful design. Very nice. "I love unique handmade items....."
And this is certainly no exception to my liking. It's uniquely different from the pitchers made before and the ones made after it as it has it's own characteristics. It's a beautiful cobalt blue and I absolutely love it. I also love the fact that NOVICA employs artisans throughout the world with handmade (not mass produced) pieces that hold their individuality as well as their beauty. I've ordered before from this artist and now am gifting pieces to my daughters. This one was well-received as I expected. I'm always confident to gift these lovely items knowing they will arrive beautifully wrapped and timely. This is a fantastic pitcher. Beautiful and well made.
" Blue Handcrafted Handblown Glass Pitcher"
Without a doubt, what distinguishes Mexican hand blown glass art is the interplay of clear glass with such colors as cobalt blue and other vibrant hues. The art of hand blown glass or vidrio soplado has diversified throughout the world, yet it is in the state of Jalisco, Mexico, where allegedly more pieces are crafted by talented artisans with techniques passed down from generation to generation. Blown glass art is said to have originated in present day Syria during the Roman Empire – that is how it arrived in Italy, where blown glass art developed various styles. At first the focus was on color and design, then came the introduction of new techniques that resulted in greater transparency and thus fragility, which were highly admired. Thus clear glass items became more valued over tinted glass. Blown glass techniques made it possible for a greater number of products to be crafted, making glass a material of frequent use in the creation of drinking glasses, wine and liqueur glasses and other type of recipients. Without a doubt, what distinguishes Mexican hand blown glass art is the interplay of clear glass with such colors as cobalt blue and other vibrant hues. Techniques have been refined since the 18th century, when this art form was introduced in Mexico by the Spanish, and spread throughout the country. It is said that blown glass arrived in the region of Guadalajara, Tlaquepaque and Tonalá in 1820, thanks to an initiative by the Church whereby priests wanted to improve the work of the small glass workshops, so they brought two master artisans from Mexico City. Nowadays blown glass is a term reserved for the crafting of glass objects through the creation of air bubbles in the molten glass. One way these bubbles may appear is by injecting air through a metal tube with the use of a machine. The other method, featured in NOVICA's Hand Blown Collection, is the traditional way – when the artisan holds the metal pipe with one hand, picking up the molten glass with one end of the tube, spinning it while blowing through the other end of the pipe and shaping it with the other hand. In Mexico, hand blown glass can result in any form or shape imaginable: tequila shot glass, highball, old fashion drinking glasses, and jumbo sized glasses. There are martini, wine and champagne glasses as well as beer goblets. Other shapes include pitchers, vases, ice buckets, snack bowls, salad bowls, fruit bowls, dessert cups and bowls, etc.